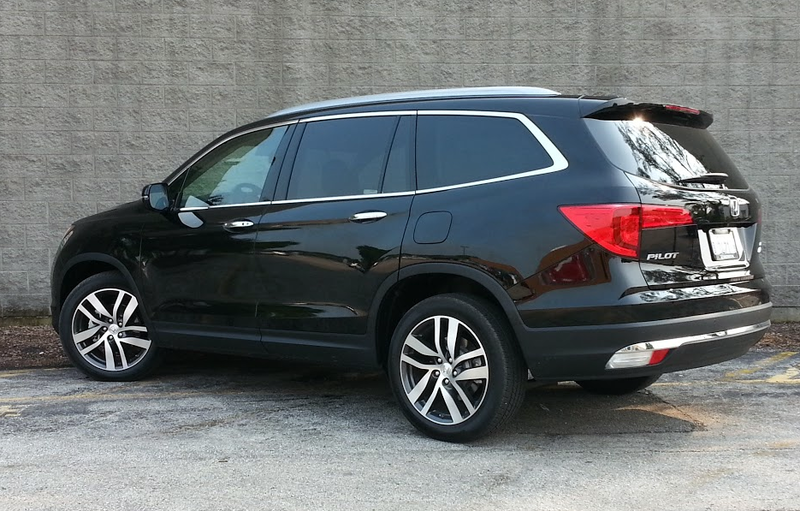 The all-new Honda Pilot is one of 2016’s most significant redesigned vehicles, and after test driving a top-line Elite model, I’d also call it one of the best. 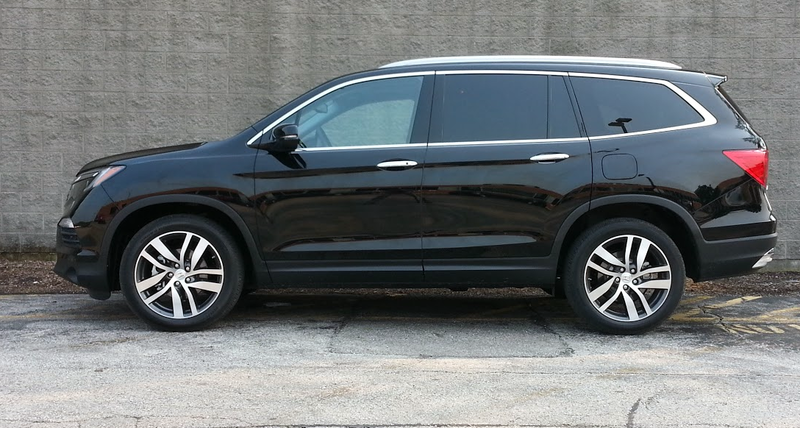 The 2016 Pilot sheds its former boxy profile in favor of slightly sleeker lines that bring it more in step with the look of most class competitors. It also gets a host of newly available luxury, technology, and safety features, all while improving on the already excellent passenger and cargo versatility that have long made it a class standout. For more specifics on the Pilot’s new features, you can check out our First Spin report here. 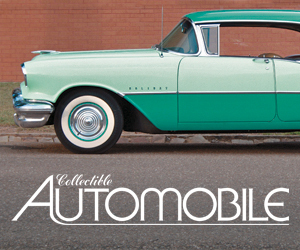 Elite-model Pilots come standard with 20-inch alloy wheels. Our tester was the top-of-the-heap all-wheel-drive Elite model, which comes loaded up with standard features such as 20-inch wheels, blind-spot monitor with rear cross-traffic alert, panoramic sunroof, heated steering wheel, heated and ventilated front seats, and heated second-row seats. Note that those second-row seats are captain’s chairs instead of a bench seat, which reduces maximum seating capacity from eight to seven passengers, but also makes for easier access to the third-row seat. Even in top-line Elite trim, the Pilot’s cabin favors functionality over glitz, but it has a very high-quality look and feel. Up in the front row, Pilot foregoes the typical center console-bin lid/armrest arrangement in favor of flip-down center armrests on the chairs. This gives a slightly more open-air feel and slightly easier “pass-back” space to the second-row seats—not a bad feature when you’ve got little ones back there. Second-row seats offer excellent room for adults, and even the third-row seats are comfortable for passengers under 6’ tall. Cargo room is outstanding too; there is better space behind the third-row seats than in most competitive midsize SUVs. Useful bins on both sides of the main cargo floor are good for storing small items so they don’t roll around. And, rear cargo-floor panel can be positioned about four inches below the load-floor surface, creating a handy shallow bin. With both the second and third rows folded (and they all fold perfectly flat), the cargo area grows cavernous. Pilot’s 2nd-row seating area is spacious; the seats slide fore and aft for more versatility. The 3rd-row seat is reasonably easy to access, and will accommodate average-sized adults. The Pilot is laudably tractable for a “plus-sized” three-row midsize SUV, and the 280-hp 3.5-liter V6 supplies adequate acceleration in most any driving situation. The up-level Touring and Elite models come standard with a 9-speed automatic transmission and an unconventional push-button gear selector. 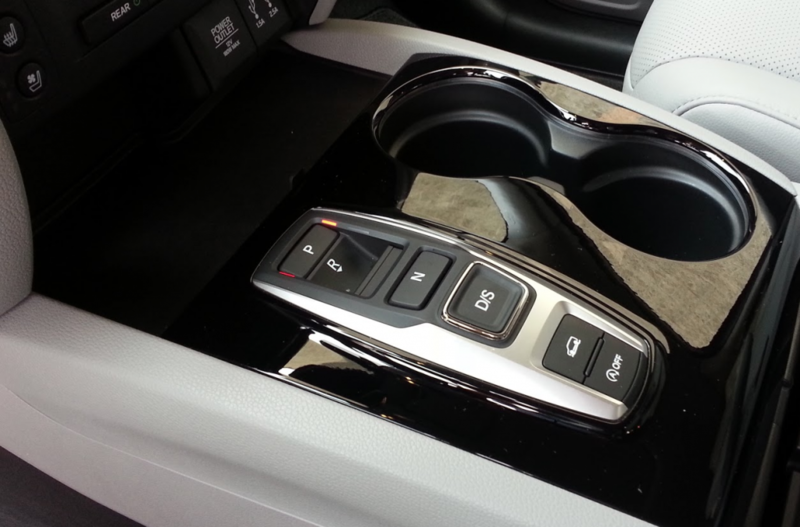 This shifter frees up console space, but it takes a bit of acclimation—I warmed to it eventually, but some drivers might not. The Pilot has a fuel-saving stop/start feature, which shuts off the engine when the vehicle comes to a stop and restarts it automatically when the driver releases the brake pedal. I found the feature to be unobtrusive, though it can be shut off via a button on the console. The Pilot’s rear cargo-floor panel can be mounted below the load-floor surface to create a handy shallow bin. My complaints about the Pilot are few, and they amount to little more than nitpicks, considering how well executed the vehicle is as a whole. The unfortunately placed left-center air vent blows air right on my hand on the steering wheel. The park-assist system is a bit on the sensitive side… at times it was more of a hindrance than help, but at least it can be turned off easily. And, the Pilot uses the same touchscreen audio/infotainment system found in other new Hondas; we lament its lack of a traditional power/volume knob, and its occasionally sluggish response to inputs. Pilot Touring and Elite models use an unconventional push-button gear selector, but our testers got used to it in fairly short order. Despite its minor foibles, the new Pilot is a home run for Honda. It boasts outstanding passenger and cargo-carrying versatility, it’s packed with thoughtful storage solutions, and it delivers fine road manners and fuel economy for a vehicle of its size and heft. It was an easy addition to our Consumer Guide Best Buy award list for 2016, and it definitely deserves a spot on your midsize-SUV shopping list. 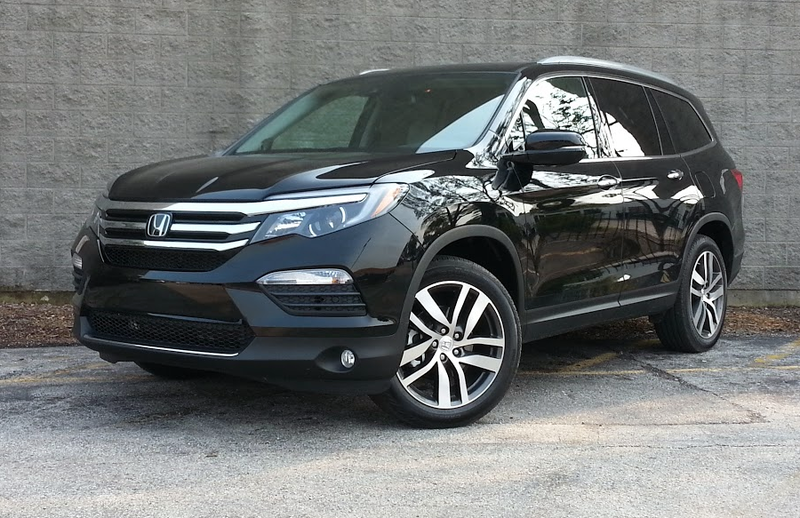 Someone once said of the Honda Accord, “It does nothing exceptionally well, but it does everything very well.” That sort of balanced demeanor has long been a Honda hallmark, and it’s very much present in the 2016 Honda Pilot. I would actually argue that in terms of ride and handling, the new Pilot leads the class, but it’s this crossover’s family-friendly demeanor that makes it such a strong candidate for households with two or three kids. Our loaded Elite test truck compromises the value equation somewhat, but this Pilot still comes in less expensive than top-line models from other brands. Additionally, a nicely equipped Pilot EX can be had for around $36,000. 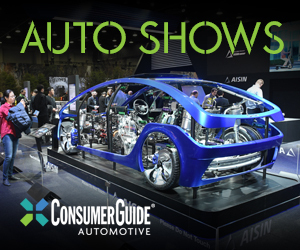 The midsize crossover segment is too competitive for shoppers not to spend time test driving all the leading products in the field, but I strongly recommend putting this Consumer Guide Best Buy at the top of your list. Though our Pilot Elite carried a sticker price of $47,300, a base LX with AWD can be had for under $33,000. Written by: The Daily Drive staff on November 25, 2015.on March 22, 2019.